Hello, and welcome to Monday! 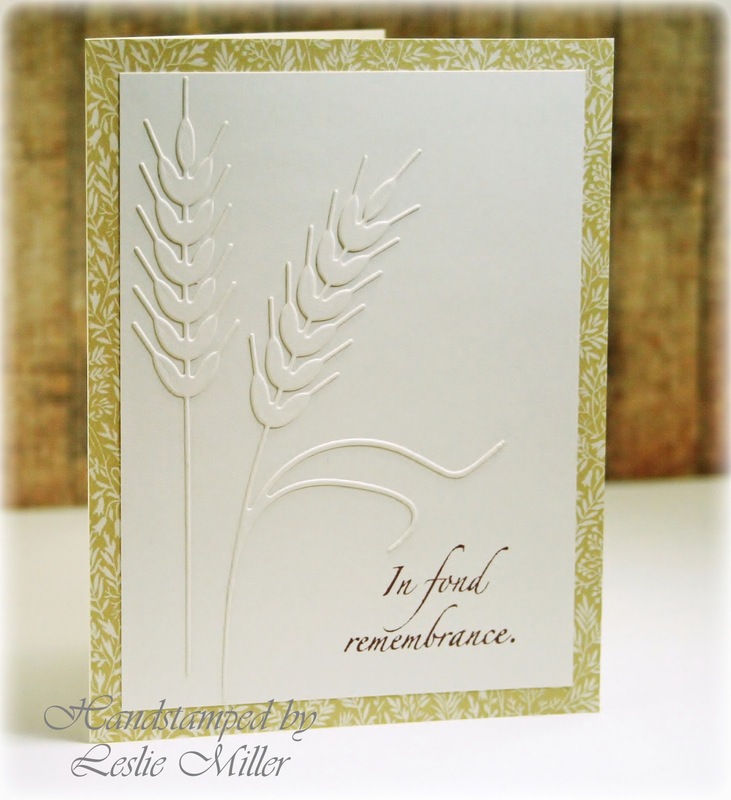 Today I’m thinking of sympathy cards and how I never seem to have one on hand when I need it. So I have two to share – the same design concept with only slight variations. Very simple. I chose my dies, then covered each card base with designer paper which I felt coordinated nicely. Arranged the dies and stamped the sentiments and they’re ready to mail. Now, you could sponge the dies, or stitch, or layer, or pop up the front panel, but the idea is to make it and mail it without delay, and with no concerns as to whether or not it needs extra postage. 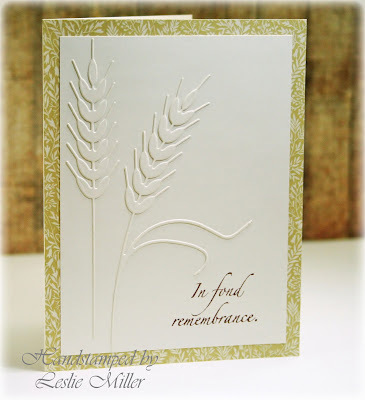 The die used above is Impression Obsession Wheat. It’s on ivory cardstock with Anna Griffin designer paper and a Words to the Rescue sentiment. 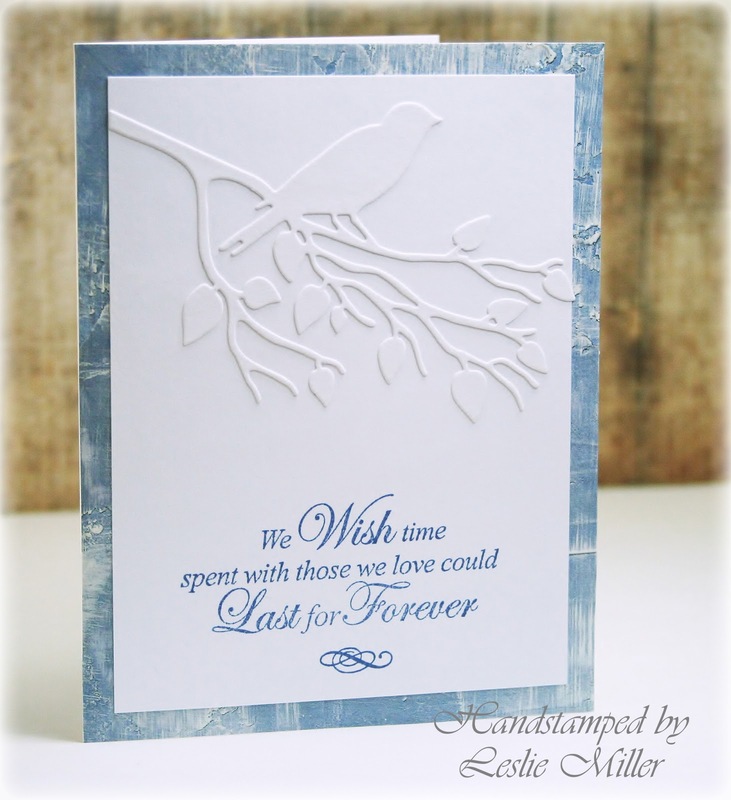 The die used in the card below is Impression Obsession Bird on a Branch. 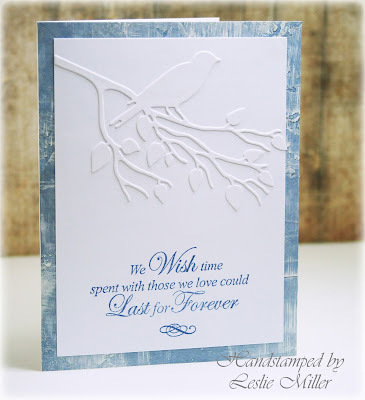 On this one I used white on white with some very old but very cool designer paper and an older JustRite sentiment. If by any chance either of these dies are unavailable at the time of this post, do not despair. The possible substitutes go on and on. Imagine any type of die for any type of card. It’s the appearance of a simple embossed design that appeals to me, I think. Whether in neutrals or in bright, juicy colors. . . just picture it – simple like these, or in the background panel of a more complex card design. Hmmmm. . . wheels turning. . .
I’m so glad you could pop in today. Don’t forget to try your hand at winning a Dies R Us gift voucher by playing along at the Challenge Blog. Currently we’re doing The Great Outdoors. Use at least one die on your card and link it up. We’d love to see it! Have a great day!